It being spring, of course. Things have speeded up in the last week. I pruned the Annabelle hydrangea one day, and two days later the buds had turned into leaves. 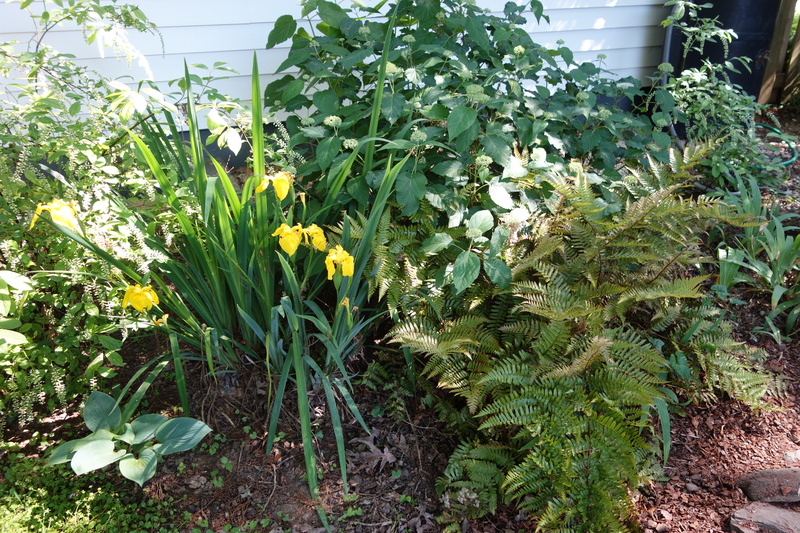 Gone for two days, I returned to find the red fern has gone from a tiny speck of green to six-inch-high fronds. 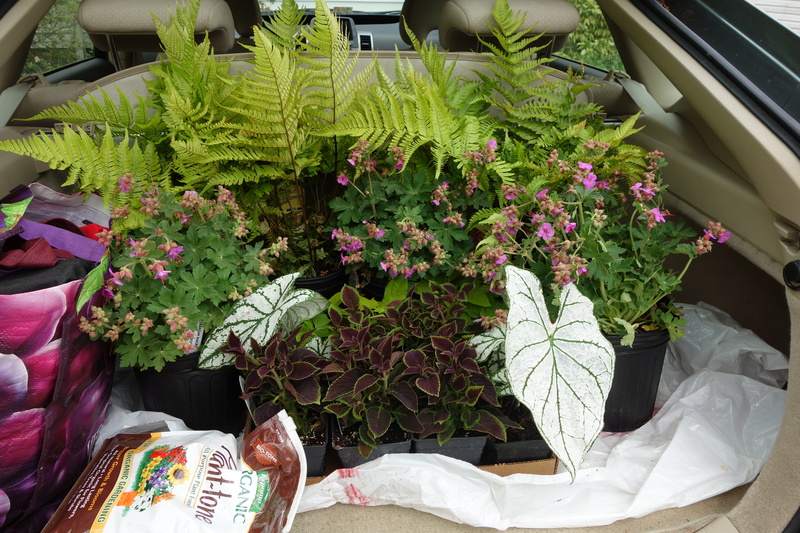 And then came a visit to Roxbury Mills to pick up some Plant-tone, and look what happened. In my defense, let it be said that I had been contemplating autumn ferns to go in front of one of the trellises, so when I saw these I couldn’t resist. 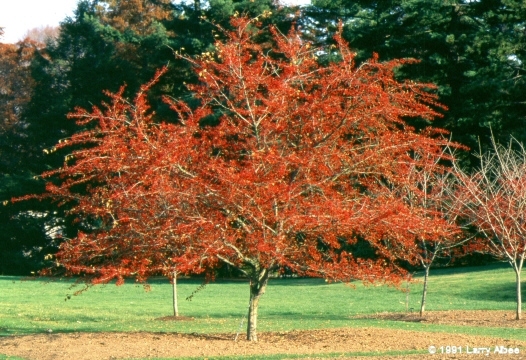 And then the geranium macrorrhizum which is not that easy to find for all that Margaret Roach touts it. These are ‘Bevan’s Variety.’ The white caladiums and the delicately edged coleus were there, too, so I grabbed them up before they sold out. Along with the light green sweet potato, they will go into containers. So in fact, it was all planned and must be in the budget! A couple years ago I did a big seed order and started lots of seeds indoors. Truly, lots of work and not such a big jump on the season that it made a huge difference, in my estimation. So this year I decided to, first, do an inventory of what I already had (brilliant plan), then, choose seeds that could mostly be sowed outdoors, and finally, that I actually had a spot for (brilliant plans two and three). 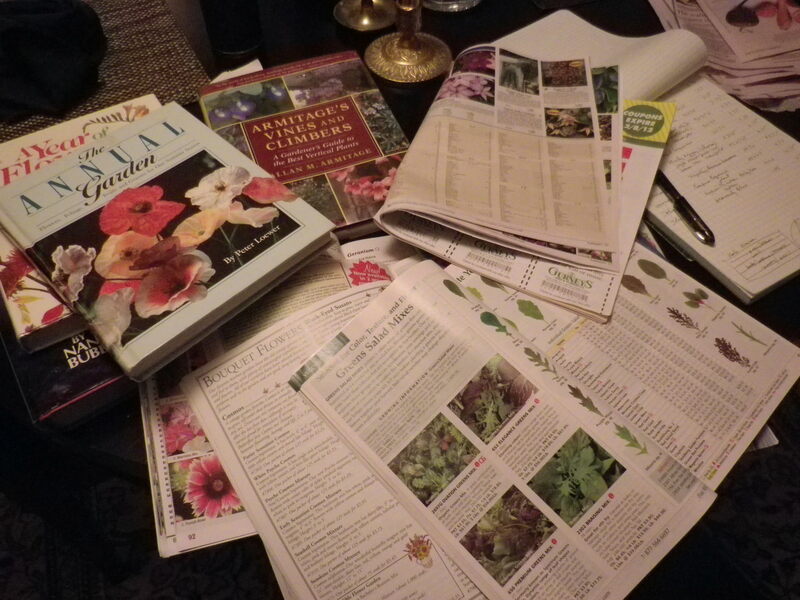 Above is the array of seed catalogs and reference books I used to select what will again be too many seeds. And yes, the selecting is at least as much fun as actually growing them. Thompson & Morgan: Lemon gem marigold and Italian white sunflower. These can go hither and yon in the front, the sunflowers in the sunny bed. Pinetree Garden: purple Trionfo Violetto bean and round black radish. In the raised bed (radish) and on a teepee (beans). Johnny’s: Ruby Moon hyacinth bean, Heavenly blue morning glory and lemon gem marigold (I got confused and ordered them twice, but no matter). The two annual vines to wreath around the mailbox (MG) and to add a purple accent to the pink bed at the side of the house (HB). Kitchen Garden Seeds: Yaya carrots, Genovese Basil and Shirley poppies, plus fingerling potatoes. These will go in the raised bed along with the Tuscan kale I “imported” from Italy. The potatoes will probably go in the potato bag again, but I’ll pay more attention to water this time. I promise. 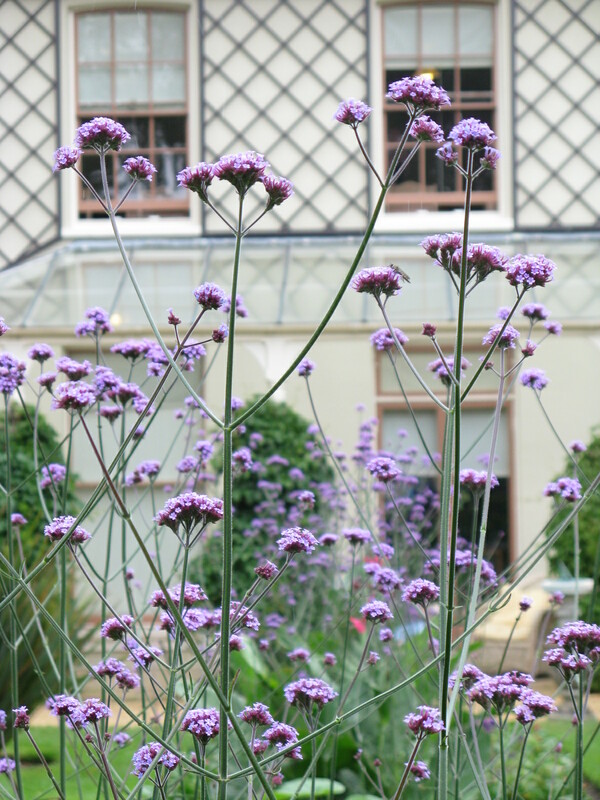 The begonia in a pot, and the verbena to twine amongst everything else in the sunny border. Anne advised me to put in the hardscape first, then look at the plantings. The hardscape she suggested for the front was such a great idea that I’ve already started on it: extend the mulched and planted area under the maple tree out to the drip line, and make a broad path from the sidewalk between there and the existing gardens, which are extended by about two feet. Okay, here, take a look. This is what it looked like when Anne came. Here’s what I’ve done since then. I’m using the newspaper and mulch method of building these beds and don’t expect to do much more with them until fall at the earliest. 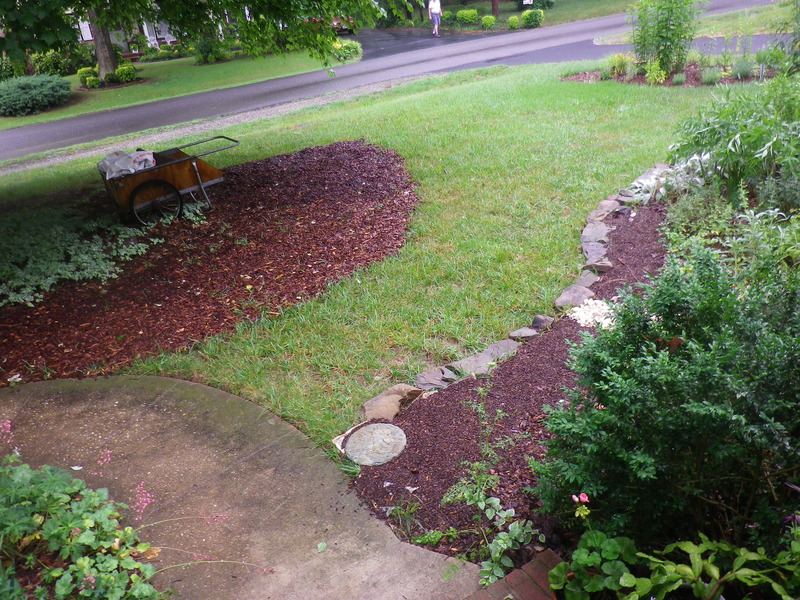 Every week I buy more bags of mulch and extend the bed under the tree just a little bit more. The next part of the plan is to run the dry creek bed, already existing in the garden, across the grass path and through the maple tree bed, curling around the epimediums and woodland asters and ending at the driveway, thus drawing the eye very cleverly along. One more thing Anne did was to suggest moving a few garden statues around. Just one little change makes a huge difference. 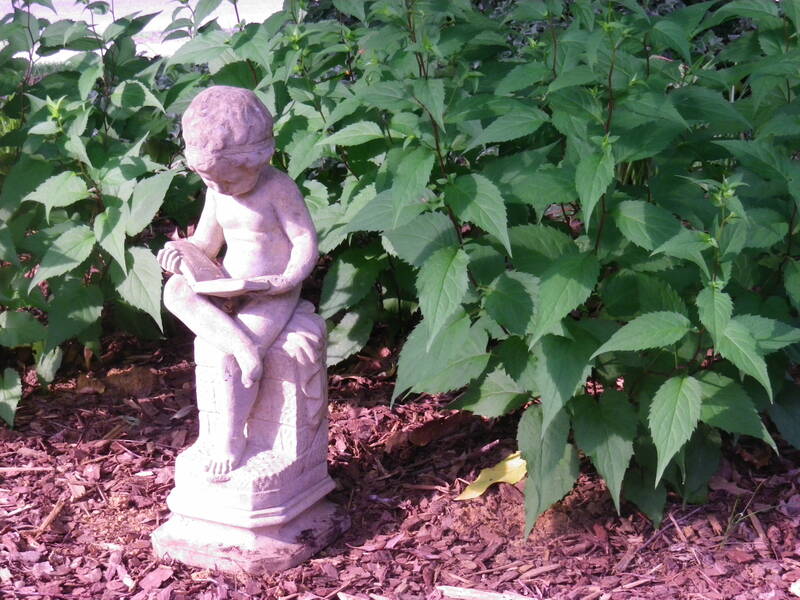 Here is the reading boy, who was dwarfed in his earlier spot by the rose. The plan is to underplant him with Japanese painted ferns and run the dry creek bed just beyond that point. 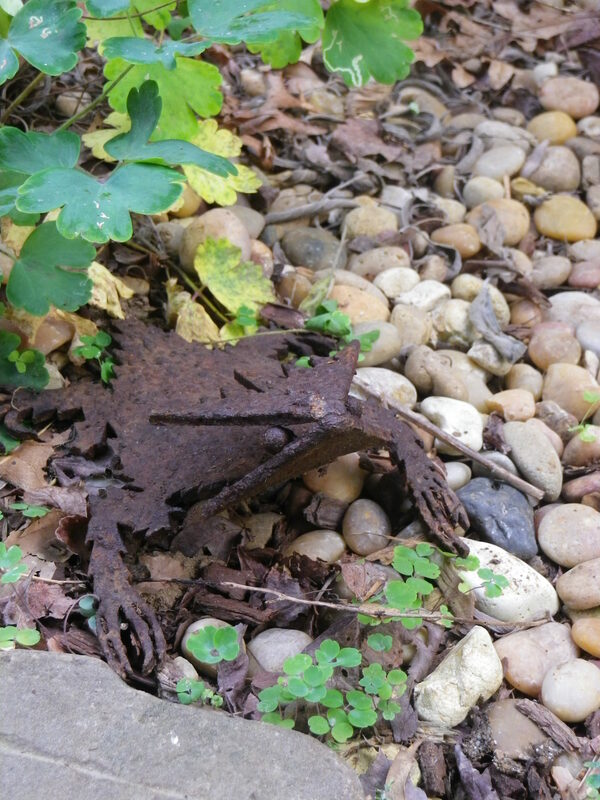 Years ago, when Mom was saddled with a frog fetish (she liked them just fine, but the family went a bit overboard in buying them), I brought her a horned toad from San Antonio. It was living in the front garden, where it could barely be seen. Here it is by the dry creek bed, where it stands out just enough that it’s a nice surprise when you spot it. Anne also asked delicately (though she’s pretty blunt) how much I liked the myrtle around the lamppost. We both agreed that myrtle should be rooted out of most places it appears, so she went forth and suggested making this more of a focal point. (Another example of a new set of eyes seeing something that I had clearly stopped paying attention to 15 years ago when I finally got the English ivy out of that spot.) She recommends a boulder or several big stones in this spot. Hmmm. Interesting – no plants at all? I will ponder. I followed up with Anne Little on some garden advice. She came out twice and gave me enough good ideas to keep me busy for years to come. She kindly said that my garden was wonderful, by which I think she meant that the elements were good, they just need to be re-arranged a bit. There’s nothing like having an outsider who doesn’t really know you looking at your garden and seeing it without the history and emotion you bring to it yourself. 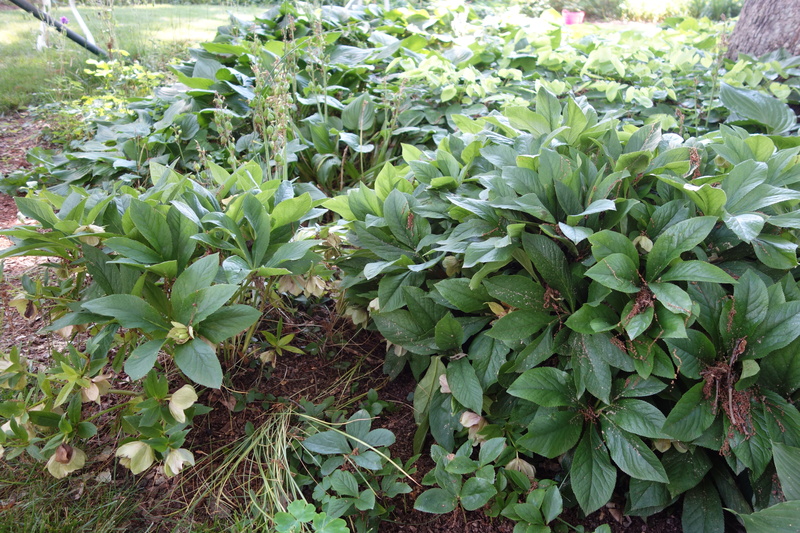 In the front garden, instead of edging it with the coral bells (as Mom advised me twenty years ago, so this is close to my heart), weave them into an S curve that goes the whole length of the garden. Move the hakenachloe towards the front. 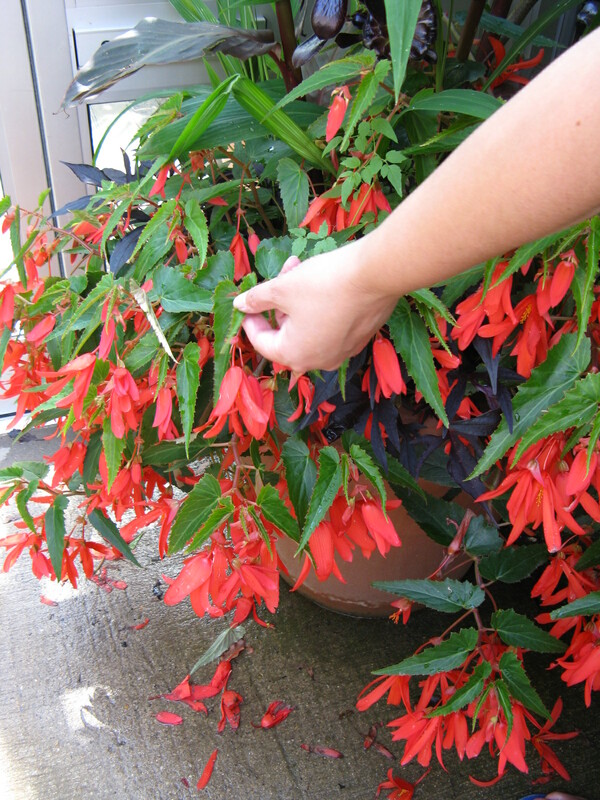 Take out the balloonflower and plant it along the back edge of the walkway garden. 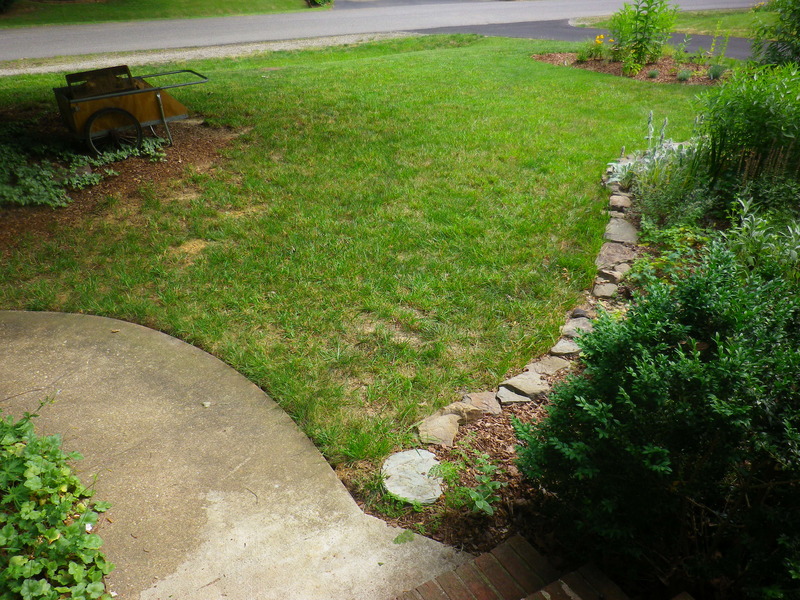 The boxwood to the left and on either side of the steps to be planted along the fence line in back. Feathery yews to be planted in their place. The lone aucuba along the back fence was frizzled by last summer’s drought. Move into the erstwhile white garden? 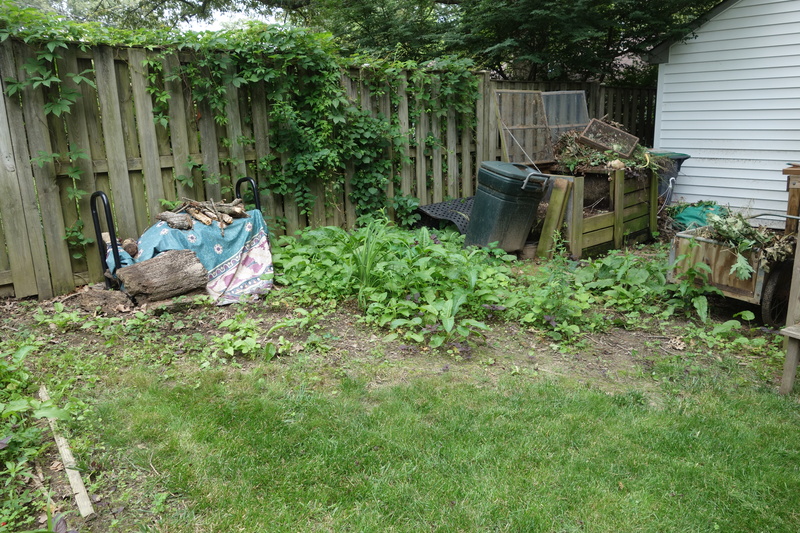 The one in back, here when I came, gets so much shade now that it doesn’t really work except as a bulb cutting garden. 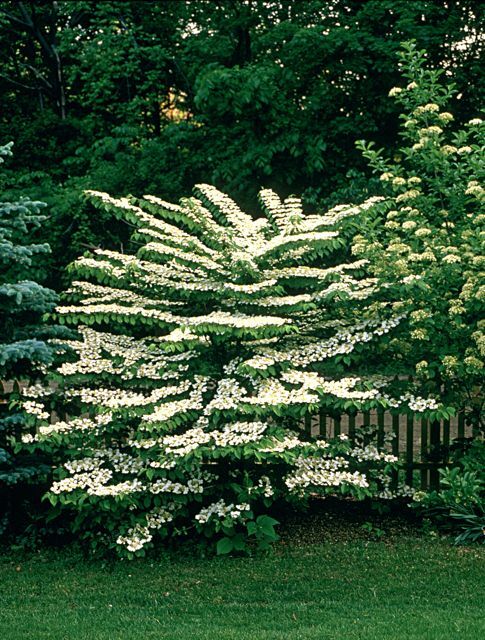 Anne recommends three shrubs in that corner, such as itea, Beauty berry, or viburnum (Arrowood, doublefile, cranberry, Korean or leatherleaf). or redbud ‘forest pansy,’ ‘hearts of gold,’ or ‘Oklahoma.’ Plant St. John’s wort in front. 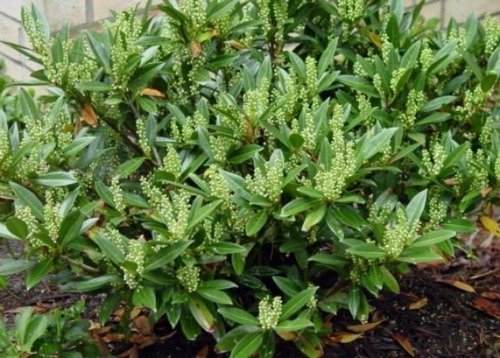 Put a cherry laurel skip or abelia grandoflora (6′ x 6′) where the aucuba was. Finally, in the corner of the white garden, between the back of the shed and the fence, plant a sweet bay magnolia. I do need to check on light needs for all of these. No one ever believes me that the back gardens are part sun at best.